One of the highlights of my work week is when my two girls come in my office and interrupt what I’m doing. Since my wife, Jennifer, leads Bible studies at our church and is a part of MOPS (Mothers of Pre-Schoolers), it’s not uncommon for my 2- and 4-year olds to come by my office at church once or twice a week before they head off to play with their friends in the church childcare. If you know me at all, you know that when I’m working at my desk, I tend to be focused and don’t really like interruptions. Jennifer calls it my “work mode” and knows pretty quickly if she calls me when I’m right in the middle of it. Even if I’m in “work mode,” my girls have a free pass to come and see me in my office, give me a hug, knock a few things off my cluttered desk, and draw on my whiteboard. The only time they don’t have that pass is if I am counseling someone in my office. They’ve even interrupted meetings before, and I’m always happy when they do. I learned it from Jeff Hornacek. 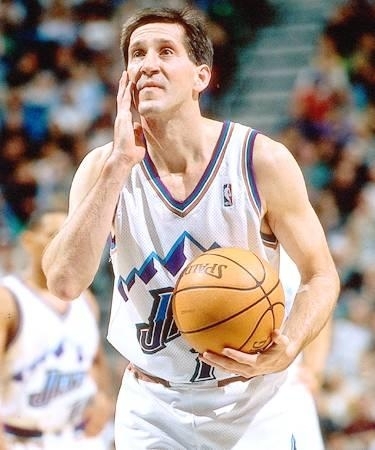 Jeff Hornacek? Former Iowa State University basketball star and one of the best shooters to play in the NBA? Yep. He taught me something very important about always having time for your kids. Even when he was right in the middle of a game, he had time to say hello to his kids. So even Jeff Hornacek, an NBA all-star, had time for his kids in the middle of a basketball game, whether it was a preseason game or the NBA Finals. And it didn’t hurt him one bit. His career free throw percentage was 87.7%, and in his final season, he shot 95% from the free-throw line. Not too shabby. So the next time you don’t feel like you have time in your work schedule to love your kids, call your wife to check in, or meet your family for an impromptu lunch, remember: if Jeff Hornacek can do it, so can you.